View More In Wind Sculptures & Spinners. Our mini sized wind spinner will add a vibrant touch of color to any area in your landscape or accent your plants in your gardens. Each powder coated steel stake stands approximately 44" tall and has a 4" fork to stake securely into the ground. The 12" diameter spinner is painted in brightly colored metallic shades to add a touch of elegance to your outdoor décor. 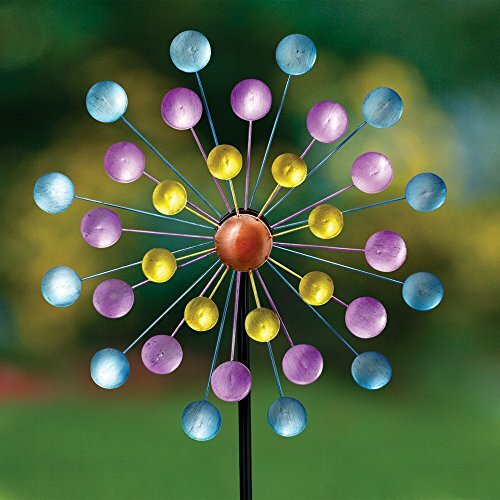 Our rainbow metal spinner will create a visual explosion in your yard or garden. The mini sized wind spinner will add a vibrant touch of color to any area in your landscape or accent your plants in your gardens. Each powder coated steel stake stands approximately 44" tall and has a 4" fork to stake securely into the ground. If you have any questions about this product by Bits and Pieces, contact us by completing and submitting the form below. If you are looking for a specif part number, please include it with your message.